For Greek Cypriots, there are many fasting days defined by the Orthodox Church, and though not everyone adheres, many do. Pulses are eaten instead, sometimes cooked in tomato sauce (yiahni in Greek) but more usually simply prepared and dressed with olive oil and lemon. On some days, even olive oil is not allowed. These meals often consist of raw onion, raw garlic. Bamies (okra or ladies’ fingers) are baked in the oven with tomato and oil, and kounoupidhi (cauliflower) is also given this treatment. 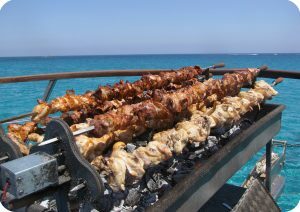 Preserved pork is very popular, and before refrigeration, it was the main source of red meat available to Cypriots. Lamb and goat meat is also preserved as samarella, made very salty to prevent the fatty lamb meat from going rancid. Very popular amongst both communities is preserved beef. The whole silversides and briskets are salted and spiced quite powerfully to make pastourma/bastirma. Many Cypriots consider snails a delicacy. The most popular way to prepare snails is to barbecue them. Another popular variation is to cook them with onions, garlic and tomatoes. Mezedes is a large selection of dishes with small helpings of varied foods, brought to the table as a progression of tastes and textures. The meal begins with black and green olives, tahini, skordalia (potato and garlic dip), humus, taramosalata (fish roe dip), and tzatziki all served with chunks of fresh bread and a bowl of mixed salad. The meal continues with fish, grilled halloumi cheese, lountza (smoked pork tenderloin), keftedes (minced meatballs), sheftalia (pork rissoles), and loukaniko (pork sausages). Loukoumades (fried doughballs in syrup), loukoum, ravani, tulumba and baklava are well-known local desserts. There are also pasti?, cookies made of ground almonds, that are offered to guests at weddings. Cypriots also make many traditional sweets that are usually made of turunch/ bergamot, figs, tiny aubergines, fresh fleshy walnuts, watermelon or pumpkins processed akin to jam but without the over-cooking. Anari, is a crumbly fresh whey cheese, similar to ricotta, made from goat or sheep milk. Two varieties exist, dry and fresh anari. Dry anari is salted and is much harder than the fresh variety, and is served grated with pasta dishes and Giouvetsi, while fresh anari is eaten in slices with honey or carob syrup. Ayran is a traditional drink made of milk. Its recipe varies from region to region. Among Cypriots traditional brandy and zivania are of the most popular drinks on the island. Zivania, a grape distillate similar to Cretan raki, is another popular spirit. Evidence of wine production on Cyprus goes back for millennia. Commandaria, the oldest wine in continuous production, is a popular dessert wine.